What is the Daylight Experience? Desire2Learn is updating D2L with a new look and feel for the user interface. This updated design provides increased visual appeal including new fonts, icons, colors, and cleaner formatting. There have been changes to improve responsive navigation for mobile devices, tablets, and other narrow displays. Tools now have a consistent look and feel with a focus on learning activities. The Daylight Experience also features a new My Courses widget that provides a responsive tile-based layout and courses that display with images. The My Home page is the first page you land on when entering D2L. Here you will find the My Courses widget, the course selector, and access to a number of other helpful resources. Across the top of the My Home page, you will find the Organization-level navigation bar. This bar is available on almost every page within D2L. Clicking on the icon of the house will always return you to the My Home page, as will clicking on the logo for CCCOnline. As you look to the right, you will see the Course Selector, often refered to as the "waffle". This tool is described below . To the right of the Course Selector are three icons. These will allow assess to D2L internal messaging (the envelope), to subscription alerts (the talk bubble) and to other system notifications (the bell). When there are new items or alerts in these areas, they will display an orange dot. 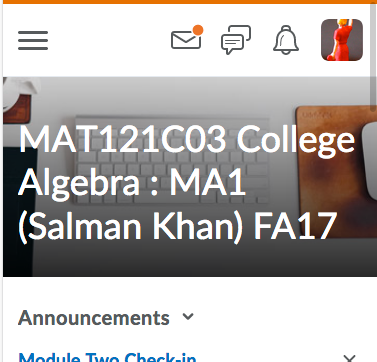 Also, clicking on the envelope icon will navigate to the D2L internal messaging tool. Next to these and furthest right on the page is the user menu. Within this menu you will find options to set your personal preferences and to log out of the system. 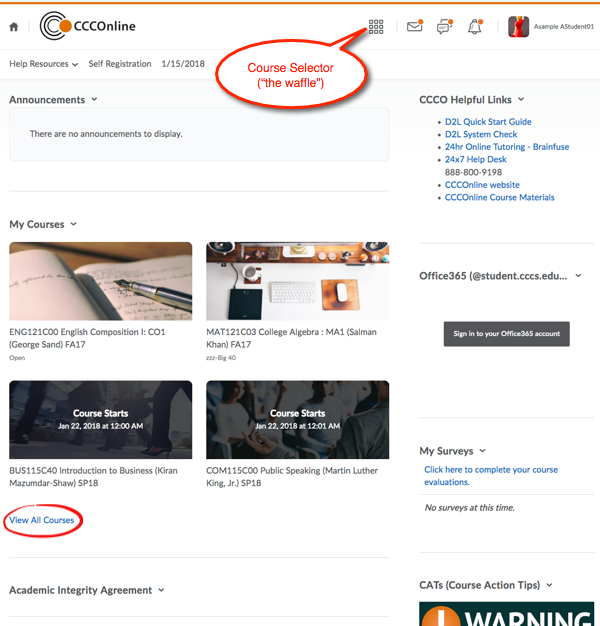 Below the Organization level navigation, you will see a dropdown menu with several help resources and the self-registration link where you can sign up for non-credit helpful courses such as Essentials of Online Learning and the Writing Center. Also, anytime you see the date displayed in a navigation bar, you can click on it to open your personal calendar. Depending on how your instructors have set up their courses, you may have due dates listed here and can enter your own information to help you stay on track. 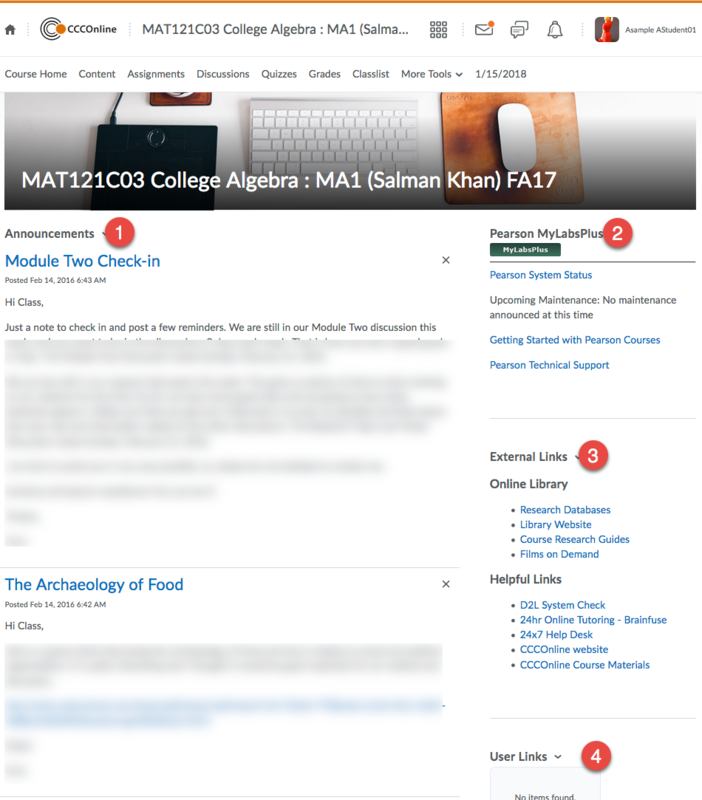 For most users, the My Courses widget will initially display tiles with your current and upcoming courses. What shows will vary based on how many total enrollments you have. 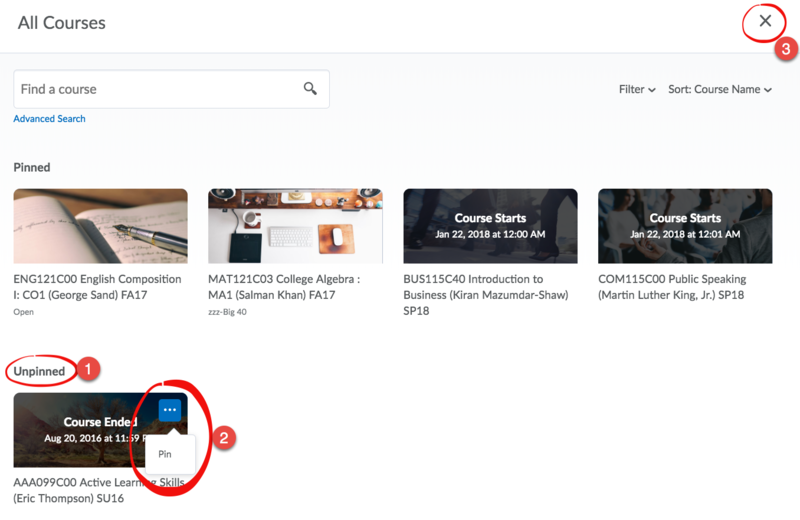 You can adjust what is displayed by pinning and unpinning courses (See “ Pinning Courses ” for more information.) To see every course in which you have been enrolled (past, present and future), click the “View all Courses” link at the bottom of the widget. Clicking on any course name or image (in either the widget or the View All Courses screen) will take you to the Course Home of that class. In the top navigation bar, you will see a square of nine smaller squares. This is the course selector. When you click on this icon, the dropdown menu will show currently available courses in which you are enrolled. This list will not display courses that are past their end date nor courses that have not started yet. Clicking on any course name will take you into that course. Clicking on a tile in the My Courses widget or on a course title in the Course Selector will take you into that course. The first page you see upon entering at course is the coures home page. Much like the My Home page, this page is made up of navigation and widgets. 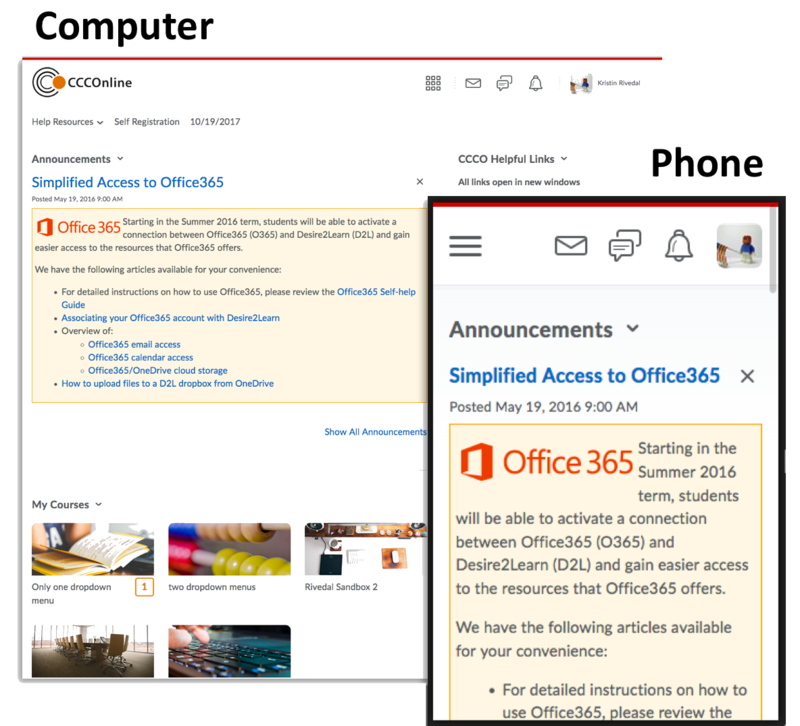 As noted above , the top strip of the navigation bar has links to access the My Home page, internal messaging, and other alerts. Once you are in a course, it will also display the course title. You can click that title from anywhere within the course to return to the Course Home page. Below the Organization navigation, you will find the links needed to access the various areas of your course. The Course Home link is a second option avaiable to return you to the Course Home page. Content is where you will find the course syllabus and other learning materials. The content area will also often have links to your discussions, assignments and quizzes so it is very important that you review the materials there often. Reading to the right, you will see links for Assignments (where you upload files for your instructor), Discussions, Quizzes, Grades and Classlist. The More Tools dropdown will offer less frequently accessed items such as Class Progress, Groups, and Rubrics. When viewing navigation on smaller screens, the navigation will collapse first to show a "More…" link and, if the screen is still too small to show the navigation, it will display three lines ("sandwich" navigation). You can click on that icon to open the navigation menu. First you will see the Announcements. This is the area where instructors will post timely updates, information, and reminders. Be sure to scan this widget every time you log into your course so you don't miss important news. Depending on your course, the widget in the upper right of the page may be related to specific digital integrations included in this course. If your course uses Pearson MyLabs, WileyPlus, McGraw Hill Connect or some other publisher materials, you may have links to helpful information here as well as technical support items specific to that publisher. Either below the publisher widget or in place of it (if your course does not use an external publisher site), you will see the External Links widget. This contains links to library resources, help resources and tutoring. Below the External links widget, you may find that your course includes other links. If so, they will be listed here but don't worry if this widget does not have anything in it. Some courses use it but many do not. If this page is viewed on a smaller screen (or in a smaller window), items 2, 3, and 4 will move below the Announcements to form a single column. Just scroll down the page to see them. Posted by: Kristin Rivedal - Tue, Jan 16, 2018 at 10:04 AM. This article has been viewed 2944 times.